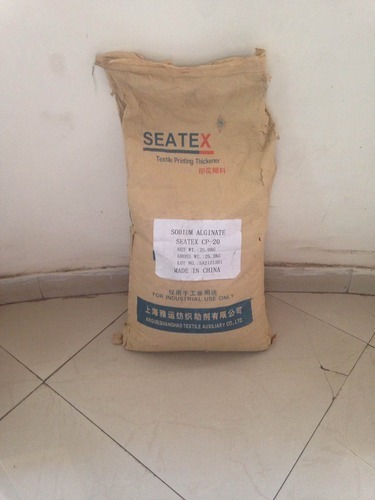 Seatex CP-20 is a textile printing thickener. It quickly dissolves in water and during printing provides a great finish. It makes the cloth extremely soft and has very high colour value. The washability is extremely good. CP-20 is used for reactive dye prinitng and provides a smooth texture and bright colour with a clear product outline. Established in the year 1970, S.R.K. Enterprises is one of the top-notch suppliers, traders and importers of the market affianced in the area of offering a world class collection of Industrial Chemicals. Procured from certified and trusted vendors of the market who possess rich expertise in this field we make sure that the entire collection is free from impurities and his highly effective in nature. Besides this, the consistence, longer shelf life and effectiveness of our products have helped us in catering a huge clientele across the national market. Some of the products offered by us include Sodium Alginate, Potassium Alginate, Peel Off Face Masks, Propylene Glycol Alginate, Chemical Dyes, Polyvinyl Alcohol and Alginic Acid to our customers. All the chemicals offered by us are widely demanded throughout the nation owing to their supremacy over their counterparts present in the market. Also we deliver them in tamper proof and leak proof packing material so as to maintain their flawlessness.